More than year has gone by and 2018 is nearing its end. With 2019, digital marketers will start to focus on much greater technological innovations, shifting their focus on new trends and leaving the old ones behind. VR, AR and voice search will dominate the market trends in 2019. While we haven’t covered all the trends in digital marketing, but focus ourselves to 6 major things that will drive the digital marketing activities in late 2018 and early 2019. Yes this holds true even today and will be true even years to come. The only thing that is changed is now algorithm are much smarter in recognising spamming and plagiarism contents. Machine learning are helping ads platform to smartly place ads that are in context with the content of webpage. For a long time, marketer have taken advantages of algorithm by tweaking their pages using black hat techniques and writing copied content to rank higher. This has changed since machine learning understands the user context and behaviour at much larger level and is able to differentiate between really good content and not so good content. Going mobile is not a new trend in digital marketing, people have been using mobiles since years. Even the seo techniques have already consider mobile responsive as one of the important factor of optimization. So what’s new? In 2018, google has finally made a major shift in its ranking algorithm by mobile first indexing. This means that any webpage would be considered for indexing based upon it mobile responsive factors and its load time on mobile devices. While this update by google was no surprise, as there has been huge shift in the way people access the internet. 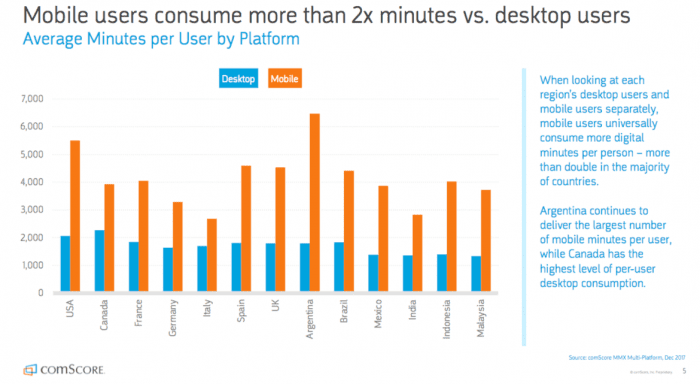 Given the analysis, the amount of usage for mobile have surpass that of desktop in most of the countries. In 2016, the digital marketing saw video as the new trend and useful tool to get attention of large audiences and gain maximum visibility quickly. Statistics have shown video perform better than text & image contents. Even social media channels like facebook, instagram, twitter have seen video content being gaining more responses and engagement rate. In 2018, live video have seen to be getting more engagements. Company are using live videos to promote their products, behind the scene, service experience, user testimonials, showcase the production live to users. Focus mainly on your customers and their experiences. know more about your customers, email ids & names are just not enough. With today’s advancement in digital marketing technology, you can be closer than ever to your customers. 2018 has seen many technology shift in digital marketing trends, use them to leverage great connectivity with your customers. Gain idea about what they like and what their interested inHow can you provide them with information and content that relates with themProvide them a solution and ask for their opinionsDon’t be generic, let them you can help them in something that noone has done till now.Get involved in their business in a more positive way, guide them in their journey. 2018 has already seen big giants promoting their voice devices like Alexa, Google Assistant on Android, Microsoft’s Cortana. We all have seen what google assistant can do by making human like interaction possible. Optimizing for Voice search will become the new norm in SEO. With the rise of data analytics and machine learning in 2018, gaining useful insights about consumer behaviour is no brainer. This new emerging tech has also penetrated the marketing domain. In 2018, more number of companies have been observed using data-driven marketing to gain useful insights and increase their ROI.